Dimensions: 12 x 12 in. 4 sheets of full-color phthalatefree vinyl decals. Bright, playful and filled with joy, these jungle-themed decals by artist Lorena Siminovich can be used to turn any nursery into a work of art. 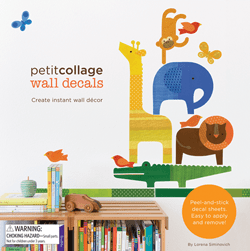 The durable decal designs are child-safe, reuseable, and easy to mix and match for unique wall art sure to please young and old alike.